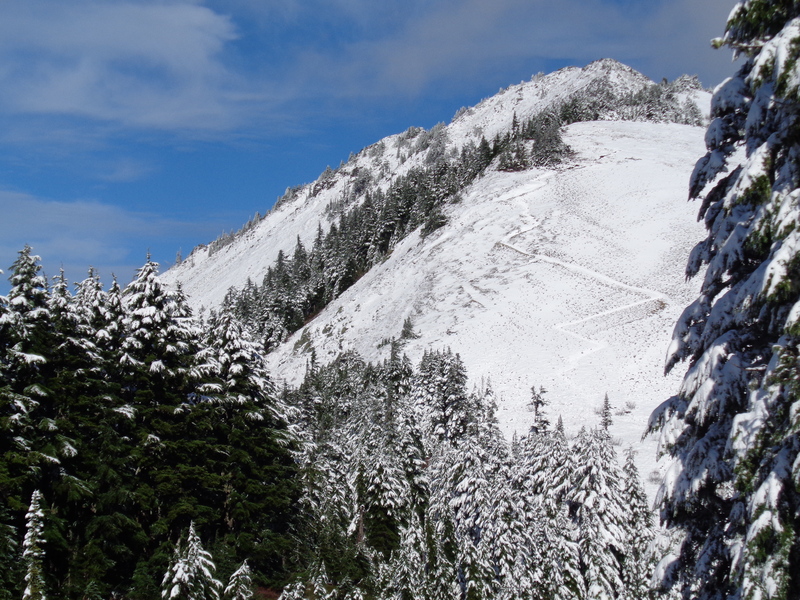 Ladies and gentlemen, it has snowed in the Cascades! I can’t rave enough about this hike. 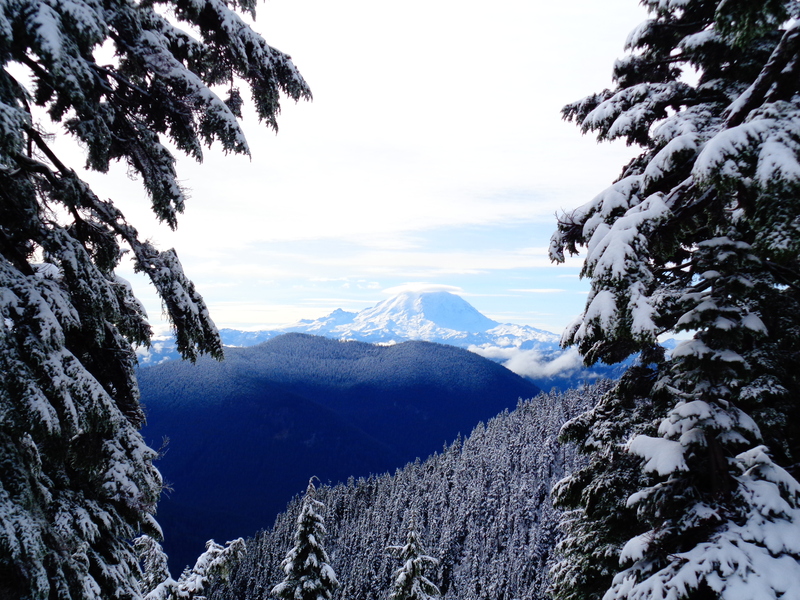 My first hike in snow (okay, besides summiting Rainier), and damn was it incredible. Seriously, this was incredible. For a hike that could have been an absolute disaster, I completely lucked out. For starters, the road was brutal. I’ve been pushing the limits of my poor Accord, and this was one of the worst I’ve been on. Nevermind potholes, there are just sections with rocks sticking up everywhere where the dirt has been washed away. But we made it without bottoming out, so it couldn’t have been that bad. Upon reaching the trailhead, I realized I had no idea which direction was south, and I had forgotten my compass. 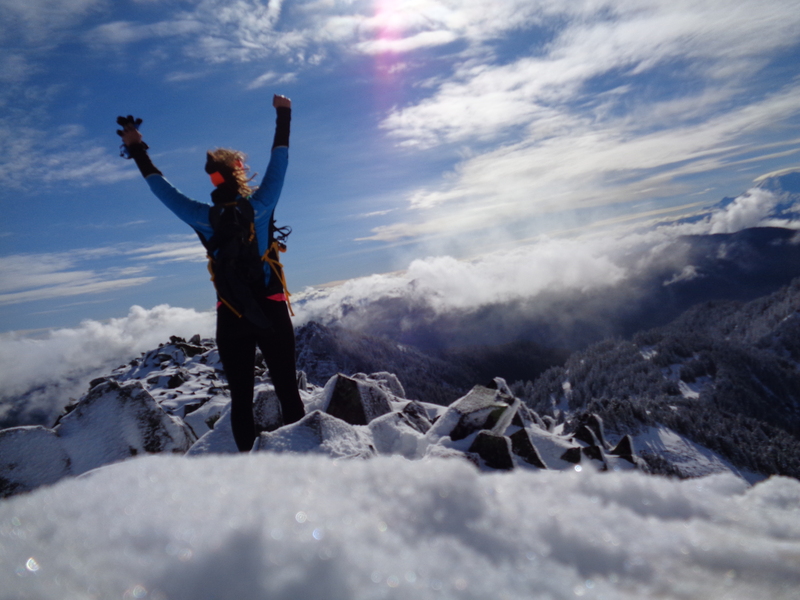 You start out on the PCT, which heads north and south. The sun was too low, there was snow everywhere, you can’t see i90 from the trailhead, and I’m new here so still relatively unfamiliar with pass names. I took an educated guess and headed away from Snoqualmie Pass (there was a sign pointing towards it). I was correct. So for any other idiots out there, take the trail that heads left as you reach the trailhead from the road. Starting out, there were patches of snow on the ground, so I took my heavy winter gloves with me just in case. I had goretex trail running shoes, no gaiters, no traction, no poles, no compass, I was a mess. I hadn’t expected snow. Anyway, the PCT was mostly a combination of mud and ice at first. Eventually that turned into a slight dusting of snow. The turn off to Silver Peak (and Tinkham Peak, which I was originally planning to do as well) is about 1.7 miles in, marked by a cairn on the opposite side of a trail. The PCT section is pretty flat, but as soon as you head off towards the peaks, it starts to climb. What was originally ice and mud became two inches of snow, then three. 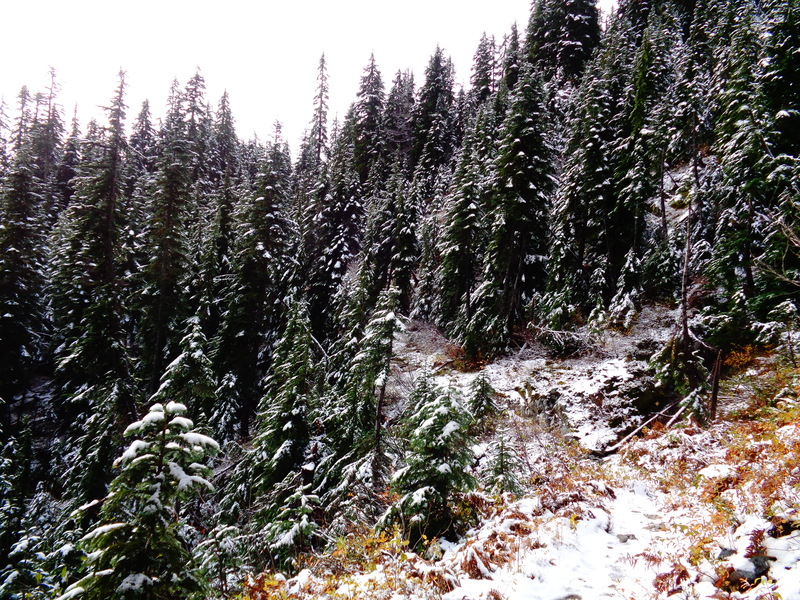 Luckily, there was a perfect, recent trail of fresh footprints heading towards the saddle between Tinkham and Silver. Stupidity runs in my veins, so I thought okay, I’ll keep going until either a) these footprints stop or turn around, or b) I can imagine someone telling me how unprepared and stupid I’m being. But it was beautiful outside, so I threw on my heavy gloves, scouted out a sturdy walking stick in place of ski poles and carried on. Once you reach the ridge/saddle, the path splits in two. 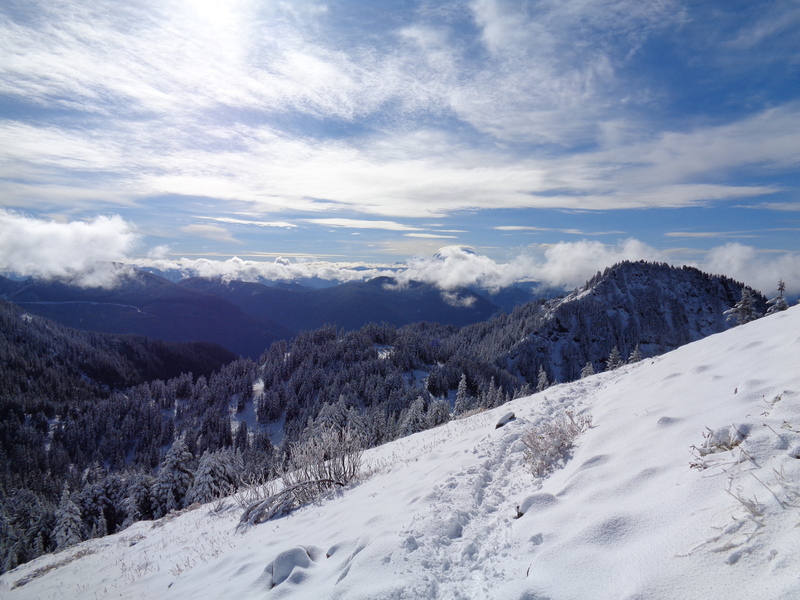 Left goes to Tinkham Peak, right goes to Silver. And look at that, the prints were going to the right. The footprints definitely left the original trail, which was completely covered in snow. At points I realized I was following them over low bushes and through clusters of conifers, but the views of Rainier were amazing, seeing snow on the trees was refreshing, and I had already committed to following the path left by my fellow hikers, so I had to trust them. From the saddle I looked right and could see their path zig zagging up the slope to Silver, so I knew I’d get there eventually. Couldn’t turn back then! Hiking up the slope I finally ran into the hikers who set the path. There were three, and I thanked them for leaving a path since I wouldn’t have made it that far without them. I probably looked ridiculous standing there with my walking stick and Nike shoes. The Nikes (wildhorse GTX, for those who are curious) get some snap judgements from fellow hikers, but come on, they’re goretex with trail lugs so they aren’t all that bad. But in shin deep snow… you win, they aren’t ideal. I asked the hikers if they had left such a perfect trail to the top, and they said yes! Great! Up I went. The top was breathtaking. I was originally bummed to be doing Silver Peak because I thought the pictures looked mediocre, i90 is right there, it’s not that high (the list goes on) but when everything is covered in snow yet the sun is shining, it’s beyond words. I was well dressed in terms of layers, and spent some time taking pictures at the top. I forgot to take a falling-off-the-mountain selfie. Seriously, this was the perfect opportunity. God. Dammit. I had to leave my trusty walking stick a few dozen feet below the summit, because it turned into a bit of a scramble. I’m sure when there’s no snow it’s easy to walk up, but with all the snow and ice I felt better using my hands. But I don’t think I’ve ever been so happy in snow. 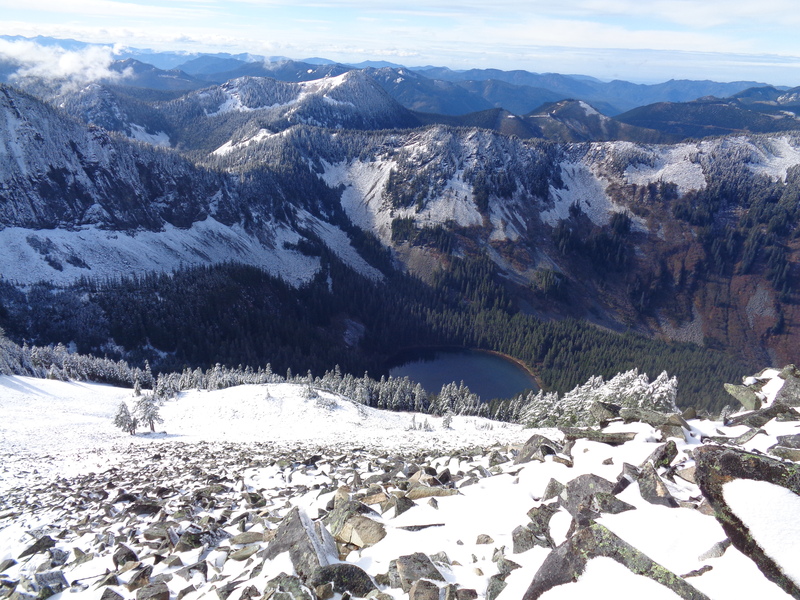 There was a great view of Annette Lake down below, which I hiked a few weeks ago. I bet it looks better with snow capped peaks in the background. Also, I need to stop taking crooked pictures. I know it’s a fatal flaw with a point-and-shoot, but I mean, I can try a little harder. I get too excited to focus unless I have lots of time to hang out looking for good pictures. As usual, it killed me to leave. But I had taken so long getting up there, I had to get back down in time for work. Tinkham was clearly not an option since I took so long, and I didn’t know if I’d have such a beautiful boot trail to follow to the top of Tinkham like I did for Silver. Plus, on my way back down, I finally got snow in my Nikes (I’m amazed it took that long). I followed the same boot path back even though I knew it wasn’t the fastest way. Since it had warmed up, the snow was melting off the trees, and with the sun shining so brightly and reflecting off the droplets, it looked like it was raining gold. 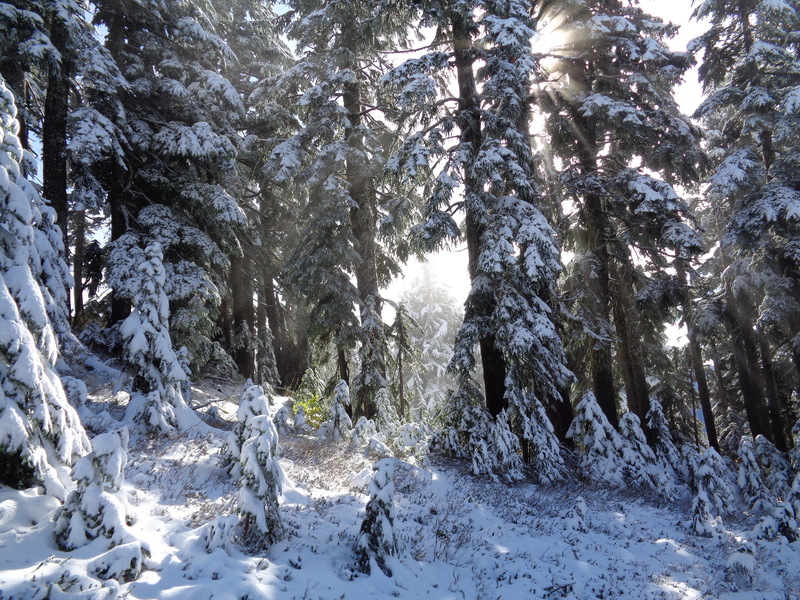 Of course no picture will capture that, but I at least got one of the sun shining through some snowy trees. When I picture “winter wonderland,” it’s gray, cloudy snow with jingle bells and Santa, but this hike redefined it for me. This was a winter wonderland. Time to get some snowshoes and ski poles so I can chase it all over the Cascades on the few sunny days we’ll have between now and May. Back on the PCT, I ran into some even less prepared day hikers. Some had boots which puts them a step above me, but they weren’t expecting snow either. No poles, no extra layers, and one kid was in regular trail running shoes that weren’t even waterproof. I wonder if they made it. I told them to be ready for snow and that there was a great boot path they could follow to the top, but with everything melting, feet would get cold and wet pretty quickly. I like to think they made it though. All I know is I’m going back next time it snows to try and bag Tinkham, except I’ll be more prepared. Can’t rely on having such beautiful footprints to follow every time I go snow hiking. Someday I’m going to have to be the one to blaze the trail. 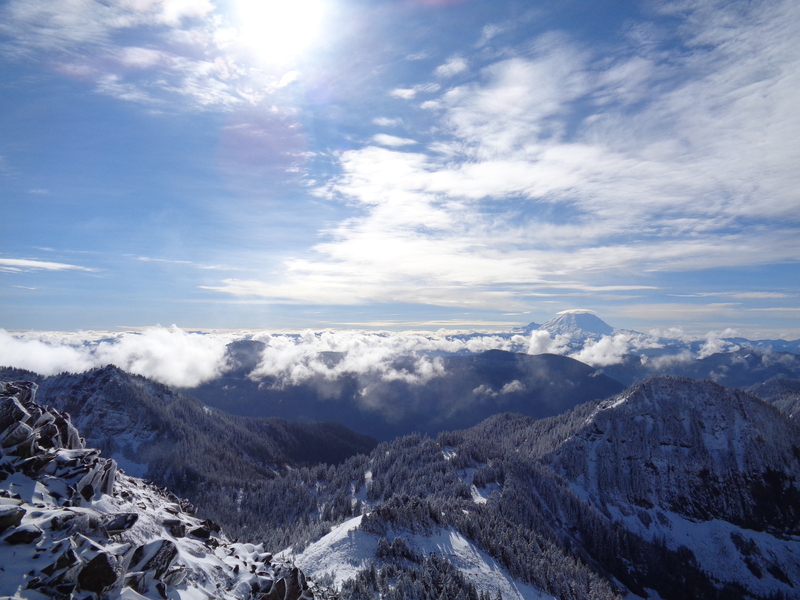 Does Seattle have places that train you for winter hiking? You should post a few.